If you’re looking for a unique afternoon activity, our self-guided tasty downtown walking tour might be just what you need. With almost all of these stops located on the Kalamazoo walking mall, you don’t have to travel far to taste a variety of delicious local treats! Enjoy a milk or dark chocolate caramel truffle, one of Cherri’s best sellers. Fun Fact: Cherri’s eye for high quality and artful presentation in her chocolates comes from owning a fine arts gallery for over 30 years. Sample several popcorn flavors! Make sure to take home some of their famous Downtown Kalamazoo Mix. Fun Fact: The owners of Pop City Popcorn once owned a 5 screen movie theatre in Kalamazoo. After they closed, the only item that didn’t sell was the popcorn machine, which launched their new business adventure. Try a cup of Tudor’s top selling brewed hot tea made from organic, whole, clean ingredients (caffeinated or decaf). Fun Fact: Tudor House Tea & Spice owner, Kelly Zajac, has provided organic, whole, clean ingredients to the Kalamazoo area since 2006. Her current storefront on the Kalamazoo Mall has been open since 2012. Indulge in one of the many popular Plainwell Ice Cream flavors. 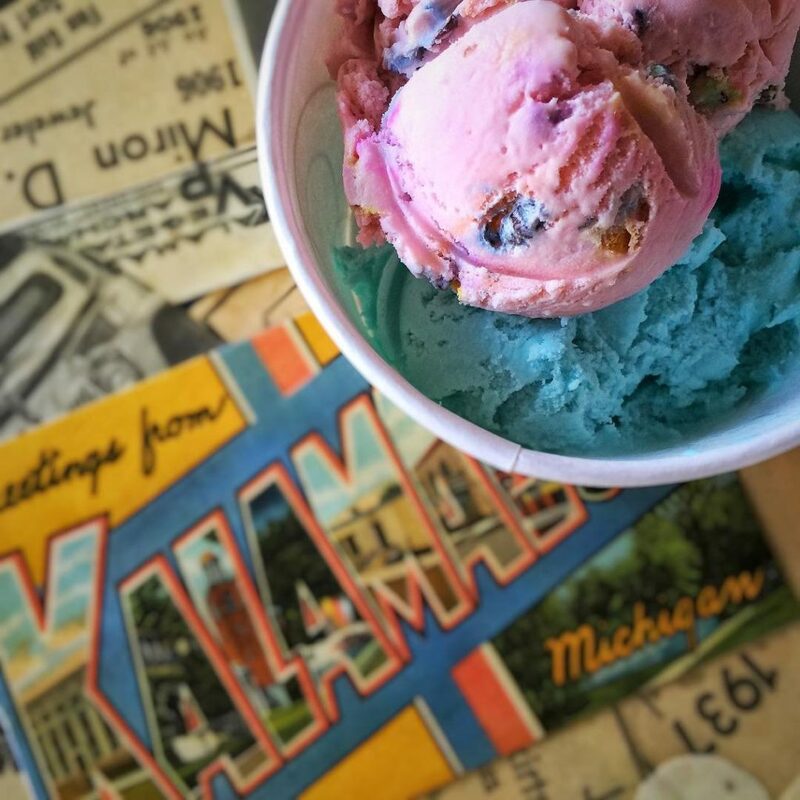 Fun Fact: Spirit of Kalamazoo has been selling Plainwell Ice Cream and Water Street Coffee since 2011. Rocket Fizz is a rainbow colored explosion of sweets, fun and nonsense. Fun Fact: This retro candy and soda pop shop has over 500 different flavors of soda, as well as roughly 102 flavors of taffy! The Stamped Robin is a wine & cocktail bar in Downtown Kalamazoo. Enjoy wine, beer, cocktails and small bites. Fun Fact: They play vinyl records and have 20 different wines on tap! Not only can you stop in and sample their wine at the tasting bar, you can even make your own private label wine! Fun Fact: All of Tempo Vino’s wines are hand crafted in small batches from grapes grown around the world. There is no other winery in the area where you can actually taste and make wine from grapes grown in France, Italy, Germany, Australia, and California.